Repiping is the process of replacing all existing domestic water piping by installing a new system throughout your home or building. Copper repiping corrects problems and SAVES YOU MONEY! It is safe, strong, and dependable. Repiping is a system wide solution that allows you to take a shower, wash dishes, water the lawn, wash laundry, and use all faucets and fixtures at the same time without reduction in water pressure. It gives you great water pressure throughout your home, improves delivery of hot water, eliminates water damage repair bills and saves money on water lost to an inefficient system. Q. 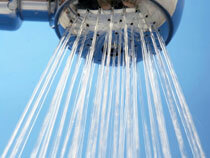 Are you experiencing low water pressure in your home? A. Low water pressure at a faucet, shower, or washing machine is caused by build up of rust and corrosion on the inside of galvanized iron pipes. As these pipes age, the rust and corrosion continue to build up restricting the flow of water. Q. 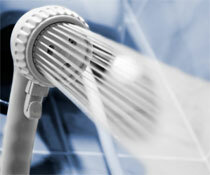 Do you get scalded in the shower when someone flushes the toilet, turns on the faucet or washing machine? A. This is also due to low pressure caused by build up of rust and corrosion of galvanized iron pipes. Q. Do you get rust colored or yellow water? A. Rusty or discolored water is caused by the rust and corrosion from inside pipes mixing with the water flowing through the pipes. This indicates an advanced stage of corrosion. Iron pipes coated with zinc to prevent rust are galvanized iron. As galvanized iron pipes age, the zinc coating gradually wears away exposing the iron. The unprotected iron rusts rapidly from water. 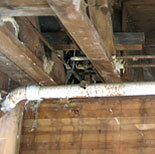 Most pre-1970 homes have this type of plumbing. Q. 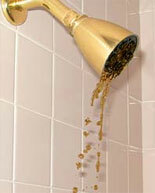 Have you had leaks in your plumbing? A. Leaks are most commonly caused by corrosion of the galvanized iron. Q. Do you have galvanized iron water pipes? A. Iron water pipes are coated with zinc to prevent rusting. Over time, they lose the zinc coating , the iron rusts, and becomes corroded restricting water pressure to faucets and showers. This condition also results in rusty or discolored water which indicates the pipes are in an advanced stage of corrosion. This corrosion will commonly cause leaks in the pipes, discolor water, as well as depositing rust particles in your drinking water .